View from the head toward Christchurch. Yesterday was a beautiful autumnal day. 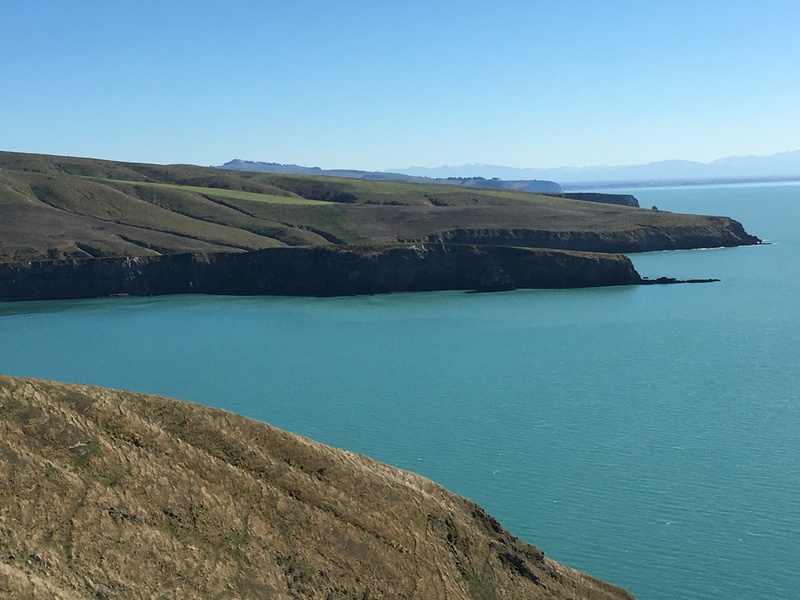 We headed out to the Banks Peninsula and did the Pigeon Bay Walkway. It has been over a decade since we’ve been to Pigeon Bay. Last time we went, the kids were preschoolers. Then, we’d hoped for some sort of beach where the kids could play in the water, but Pigeon Bay is rocky. The shoreline is covered in cobble-sized rocks teeming with life. Lift any rock and a dozen crabs scuttle away. A decade ago, the pursuit of crabs delighted the kids. Still does. Yesterday, we also noted starfish, chitons, limpets and snails under the rocks. But the main activity for yesterday was the walkway. It’s rated as a five hour return walk, but is mostly on a well-graded farm track. It’s easy going, and we did it in four hours, including a lunch break. The track runs all the way to the head of the bay. It’s not exactly a wilderness experience—the land is a beef and sheep farm—but the views are spectacular. It’s one of the few places on the Banks Peninsula where you can get right out to the tip of the headland. Out on the head, the cliffs are quite spectacular, and you can see the layers of volcanic deposits, well-spattered with poo from the shag colonies there. In the clear air yesterday, we could see all the way to the Kaikoura ranges. The best part of the walk for me was looking down on a small pod of Hector’s dolphins feeding in the bay below. The dolphins were clearly circling and corralling fish, and there was a trio of gulls shadowing them in the air, picking off the fish the dolphins missed. A lovely walk. Hard to believe it took us this long to get around to doing it.